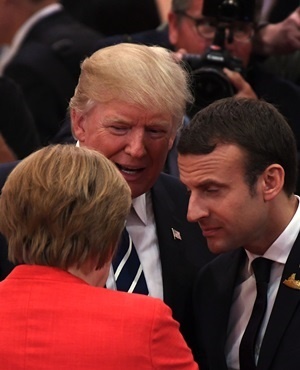 US President Donald Trump talks to German Chancellor Angela Merkel and French President Emmanuel Macron. (Patrik Stollarz, AFP). Officials at the Group of 20 summit say leaders haven't reached an agreed statement on climate change - one of the most contentious topics at the talks. The US had said it would withdraw from the Paris climate agreement. As a result officials at the Group of 20 summit are meeting but no agreement has been reached yet. European Union officials who briefed reporters on a draft final statement said the document contained a general commitment to fighting climate change, and then a separate paragraph that "took note" of the US' decision to withdraw. A third paragraph then affirmed the support of the 19 other members for the Paris deal. The officials spoke on condition of anonymity to discuss the draft before it's agreed. Officials debated language pushed by the US in which it proposed to help other countries use fossil fuels more cleanly. That, ran into objections. Meanwhile, European Union officials say the leaders of the Group of 20 countries have agreed to keep their markets open to foreign trade. But the group's draft statement also says that trade needs to be mutually beneficial and that countries can take steps to protect their markets. Trade has been a hotly discussed issue at the summit, as new President Donald Trump pushes his "American First" agenda. Trump has focused on making trade fair as well as free, and has criticised trade relationships where the other countries sell more to the US than they buy.